Located in a business park setting, this centre offers a range of facilities including an impressive reception area, a security system, meeting rooms and conference facilities. Castleton train station is a 12-minute walk away, and offers services to a range of destinations. There are also bus services operating in the local area. Junction 20 of the M62 is just two miles away, providing excellent road connections. 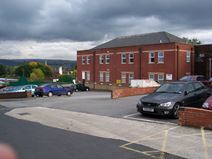 This property comprises two floors of office units with reception, meeting room, kitchens and secured on-site parking. Located on the northern outskirts of Rochdale, close to a nature reserve. Offers easy access to the A58 Manchester Road, which links to the extensive motorway network linking Manchester, Liverpool, Leeds and other commercial centres. 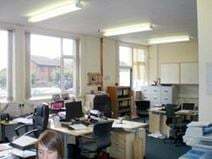 A suite of recently refurbished offices with reception, meeting room, storage area and kitchen. There is round the clock access and secure on-site parking. Located on the northern outskirts of Rochdale with easy access to the A58 Manchester Road, which feeds into the extensive motorway network linking Manchester, Liverpool, Leeds and other commercial centres. 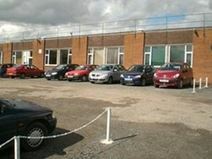 Industrial estate premises in Rochdale offering a wide range of various sized office, workshop and storage units. Situated within walking distance of town centre shops and station, with services to Manchester Victoria and Leeds. Approximately three miles from the M62, for Leeds and Manchester, and excellent links to Manchester airport. Offering both serviced office space and workshop facilities on flexible lease terms this modern business centre caters to a range of businesses of different sizes and requirements. Strategically located less than a mile from Rochdale Town Centre and the train station. This centre, in a sought after industrial location, offers renovated business units, each with available office space and toilet facilities. Parking is provided as well as day and night security. The units are lit and heated. The centre is close to Rochdale, Middleton and Manchester town centres. This historical building consists of fully serviced offices, decorated with classical features to offer a charming and elegant working environment. Available on various size and at flexible rental terms, these offices can accommodate any of your requirements. Within walking distance of Rochdale railway station, and close to the motorway network, the building benefits from excellent transport links. The centre is a Moss Mill Industrial Estate premises offering a large range of units suitable for workshop or storage use. Located to the south of Rochdale town centre, within walking distance of the rail station, with services to Manchester Victoria and Leeds. The centre is positioned just off the A664, for direct access to junctions 20 and 21 of the M62 motorway. Manchester Airport can be reached easily, for international travel.